Martin Parr headlines a line-up of star photographers on the Super Stage at this year's Photography Show. The four-day event that runs from 16-19 March at the NEC in Birmingham has once again attracted some of the biggest names from around the world to speak at the UK's biggest annual photographic event. 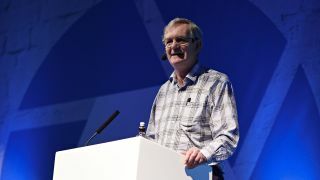 Martin Parr is joined by a number of top American photographers on the premium Super Stage. National Geographic photographer Annie Griffiths makes the journey across the Atlantic along with top fashion photographer Lindsay Adler, wildlife ace Moose Peterson and former White House phoographer Pete Souza. Completing the list of prestigious American speakers is Californian Chris Burkard who is best know to is three million Instagram followers for his amazing outdoor photography and surfing pictures. With the addition of The Video Show to this year's exhibition, cinematographer Gordon Buchanan also joins the Super Stage line-up. The wilidlife filmmaker is probably best know for his work on Springwatch and for presenting the recent BBC series Animals with cameras. Legendary, Magnum Photos photographer, Martin Parr will talk about his career in photography; finishing with a look at his new exhibition, Only Human, which opens on 7 March at the National Portrait Gallery in London. Annie Griffiths shares her journey from a rural Minnesota newspaper to the pages of National Geographic Magazine and beyond – and discusses how photography can be used as force for good. Join renowned American fashion photographer, Lindsay Adler as she discusses how she went from ordinary photographs to extraordinary image making. Based in New York City, her fashion images have appeared in numerous publications including Marie Claire, In Style, Elle, Harper’s Bazaar and more. Instagram sensation Chris Burkard shares some of the greatest lessons he has gained from behind the lens. From being thrown in a Russian jail cell, to swimming in near-freezing water, his stories are more than just pieces of advice for his fellow photographers, they create the wisdom that he says can only be learned the hard way. From birds to planes – Moose is a passionate and innovative wildlife photographer, who has more recently added aircraft photography to his skill set. Tickets for a the Super Stage speakers are available online now for £12 each, and will be held in the Toute Suite just outside the main hall of The Photography Show. There are over 200 exhibitors and over 300 free talks and demonstrations at The Photography Show, and the sister Video Show. Tickets for the show itself are available now.